Recent posts on plough vans got me thinking. As many may already know, I'm a fan of the 60/70s era and dislike all things yellow. Now I really like my rake of IRM ballasts, even if I pretend they are gypsum wagons hauling mineral freight rather than doing PW work. Hence I have no desire to have a pair of yellow plough vans . . . but there were older plough vans in much more acceptable brown or bauxite livery like the GSWR plough below, and they looked prettier. 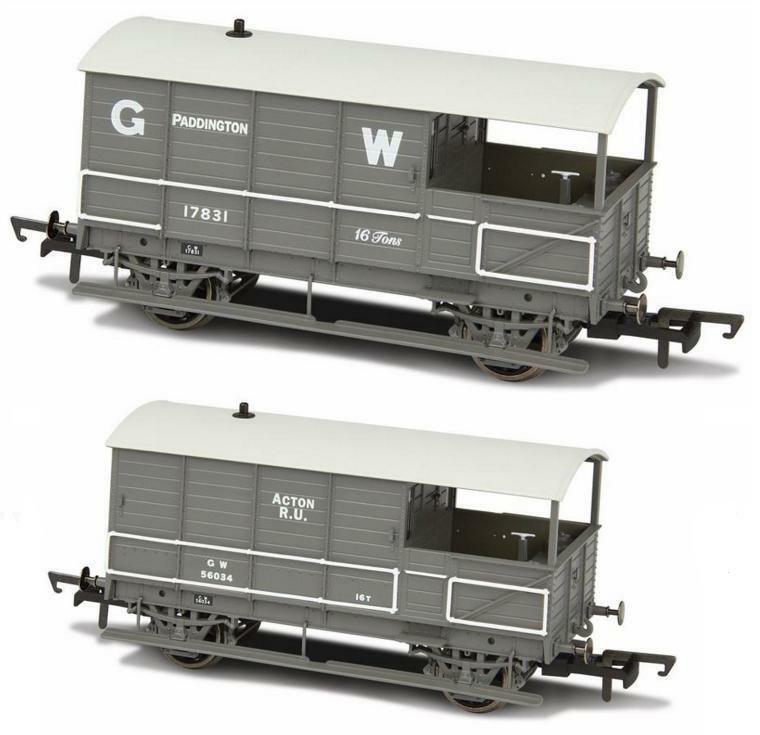 So I have decided to convert a pair of my GWR 'toad' brake vans to ex-GSWR ploughs and match them up with my rake of IRM ballasts even if not strictly prototypical, at least there won't be any yellow. They will need some modifications, add small windows, remove the full length steps, replace with steps under door, add vertical stanchion at door to roof, a plough, and respray in GSWR brown/bauxite. They will be a bit long but should pass the duck test. The alternative is to just respray a pair of BR shark vans brown, but I do like the look of GWR toads resemblance to the GSWR van. Two in bauxite would do the trick and then one day I could pretend they are hauling ballasts and another day gypsum. Will update this thread as they progress along with a few other kits and bodge jobs in the pipeline like a GSV and a luggage van.
" They will be a bit long but should pass the duck test. The alternative is to just respray a pair of BR shark vans brown, but I do like the look of GWR toads resemblance to the GSWR van "
The GSWR van is a nice van. Richie did a nice sequence of shots on it over its lifetime if I recall correctly. I'll check later and if not I'll delete this sentence as irrelevant. I don't know how much butchery you want to do to the body itself to make a platypus into a duck and I'm not even concerned with length just the general proportions. The GSWR obviously has 5 panels and a much shorter open section and the toad would benefit from a cut & shut of the 'open' end with the addition of a panel added to the closed end before windowing etc. If the vertical stanchion and door can be cut out as one piece without interfering with the bulkhead, and the units placed the opposite sides of the van it'll give you a nice riveted replacement stanchion at the doors. A third toad would be really useful donor to keep the vertical framework and paneling the same. Two cents. Good luck! Beware the colours on both of the Downpatrick vans shown. 2. Even newly painted, slightly too reddish. 3. They should have brown chassis, not black ever. Those toads above look very far off the DCDR wagon, which is based on the AA3 pattern from the turn of the century. You'd be well to wait for the Oxford Rail GWR 4 wheeled toad which is due to make an appearance soon, which has right WB, length etc. I recently found a pair of these old 1970s Hornby GW brake vans which may make better donors for modification to ex-GSWR ploughs. At least they are closer to the wheelbase length and have shorter verandas than the Bachmann GWR toads. Step 1 - coat of primer before cutting and adding bit'n'pieces. Torn between 'Duck' standards and having a go at these. I'm assuming you're going to add a section to the bodywork and the shorten the verandah by the same amount. Lima BR Mk1 BSK to CIE GSV Conversion (or perhaps RPSI 3185). I'm thinking of having a go at this. Any words of wisdom or advice would be much appreciated. Picture below is an SF GSV with the proposed Lima under. Will change bogies to B4s. I'm working on the BCK version using old Hornby CKD coaches. Anyone old enough to remember them? I take the view that it's easier to cut through individual carriage walls, rather than a complete body. Alternatively I could have a go at RPSI Maroon GSV 3173 using a Bachmann BR Mk1 brake 1st corridor donor. 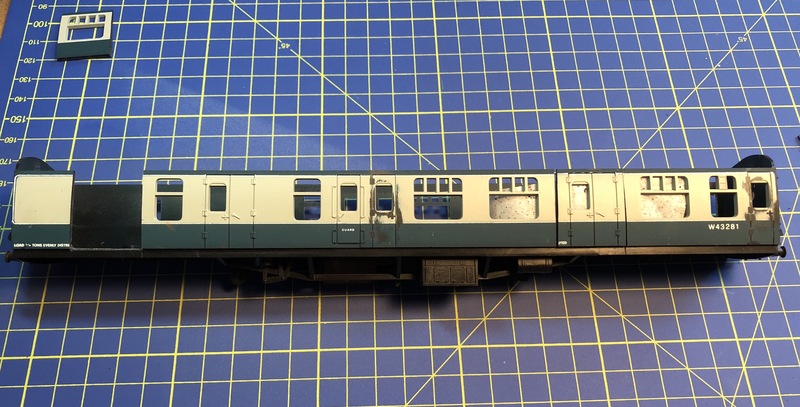 It is quite a different layout to the more common ex-BR Mk1 GSVs CIE used (e.g. 3185). There were a few others like that (3172 off the top of my head), however 3173 was changed (slightly) again when overhauled at Mullingar in the preservation era. Interestingly, I've vague recollections that while researching the vans for the RPSI website articles a few years ago I discovered that Graham Farish had actually modeled 3173 in its original BR identity as w21146. Excellent idea - but beware! The bauxite liveries on both are entirely inaccurate at all levels! First, the H van. Neither these, nor almost any other Irish wagons had black chassis. The shade of bauxite on both is far too reddish, though some of this is due to the fading qualities of modern paint - not to be confused with the fading of older paints. It should have a brown chassis and drawgear, as well as body, and roof. 1 out of 10: the lettering and logo are as correct as you'll get. In GSWR days, as per markings, these were either all black or later, all a very dark grey like loco grey. (Indeed, logo grey might have been derived from this; "normal" wagon grey, which is lighter, came roughly post-1915. If grey, then grey chassis too. The GSR and CIE painted them ALL wagon grey - again no black chassis, and most certainly not a white roof! After 1970 or so, CIE and then IE painted them all brown - yet again, chassis and all. Never were they anything remotely like the above. The more reddish shade of brown seen nowadays is a post-1995 or thereabouts invention. One or possibly two of these were heavily rebuilt and survived into the post-1990 yellow era. Yes, roofs and the lot were yellow. Black chassis are a Hornby train set invention, and are only appropriate for BR modelling, where wagon chassis WERE often black. Unfortunately, this incorrect livery detail has been widely copied in Irish preservation, where - unfortunately - between Cultra, Whitehead and Downpatrick, correct liveries on locos, coaches and goods stock alike are (at last count) outnumbered about three to one by incorrect liveries. For modellers seeking accuracy, this is indeed a great shame. Thanks JB. That's really informative. I was going to paint the brake/plough van bodies brown with grey roofs and weathered grey/brown chassis, but I like the idea of a dark grey all over. Ok I have started an attempt at BSK conversion using Lima donor. Attached pic from my iPhone of first cuts. Also test attachments using mobile theme. Will do one side at a time to keep body rigid and avoid warp. Now to fill in two doors and one windows this side. Oh if this was balsa, spruce or lite ply I'd be so at home. More anon over the coming days . . .
That's a great conversion job! Excellent work. Side two: Completed modifications to other side. Twin doors swapped with window, two single doors filed flat ready for filler. Vent window squared off. Plastic panel RHS inserted to replace double doors moved where LHS 2nd window used to be. Next step filler, file, sand and first prime to reveal any blemishes. As these Lima roofs are snap fit and pop on and off really easily will leave interior for another day, but will have to make mods to under frame and source B5 bogies. Haven't really worked much with plastic card before but enjoying trying to figure it out. Nice start Noel.Looking forward to watching this progress. GSV 3185 (BSK) continues. First coat of primer to reveal any filling blemishes. Next step is to fill the blemishes, insert the side grills, cut the water feeds at each end, and Keen systems suspended LMS gangways, B5 bogie kits from Replica, Bachmann oval buffers, modify the roof, add under frame fuel tanks, door steps, spray then decals from Studio Scale models, varnish, etc. As this is a Lima donor, the roof is also connected to clear plastic sides for the windows which slide inside the body in one piece, so will cut some of that away, but it will be useful to retain as its an easy snap fit which will allow me to fit out the interior at a later date and perhaps even add some DCC lighting and tail lamps. Flirting with the idea of leaving one of the guards door open, but might leave that for the next GSV which will be 3173 (BCK) which has a totally different door and window layout. looks very good and neatly done. Some minor progress while I got joyfully distracted with weathering other stock. Test fitted the roof before adding the vents and exhaust. A lot of internal fettling was needed to fit around the reinforcement strips added to the coach sides where panels had been added or moved. B5 bogie kits from Replica ready to be fitted and Keen Systems LMS suspended gangway corridor connectors. Also have sprung oval buffers ready to go. The divil is in the detail, there's still lots more to do to the chassis under frame, interior, ends, and possibly some grab rails. Now what about one of these CIE full brakes? Could my Bachmann ex-LMS full brake be adapted? Bachmann ex-LMS Full Brake (BG). Noel, that's smashing looking ,. very well done. It's a bit myopic to replace the bogies and gangways, and yet leave the windows, battery boxes, v-irons, underframe gear all untouched, with big old chunky mullions on the windows in particular? There's some lovely step details too underneath the central door. Just if you're going to go to the time, sweat and expense, might be worth pushing the boat out, no? Advice is always welcome from a professional model maker and one of the forums masters. I had previously mentioned there was more to do. Will try harder master and thank you for the tips and advice. . . .Next step is to fill the blemishes, insert the side grills, cut the water feeds at each end, and Keen systems suspended LMS gangways, B5 bogie kits from Replica, Bachmann oval buffers, modify the roof, add under frame fuel tanks, door steps, spray then decals from Studio Scale models, varnish, etc. As this is a Lima donor. . . I am not convinced that its easier to kitbash a plastic coach into something its not than to assemble a kit or even build a model from scratch. The SSM Bredin Brake with its bolt together construction is probably an easier and faster option for the CIE Luggage vans, Bachmann Commonwealth bogies would speed up assembly in OO. Similarly I would use the Bill Bedford sides with Comet, MK1 parts in preference to trying to modify a Hornby or Bachmann Mk1 into a BR Van. Great job on the GSV so far Noel! I found the roof vents, fuel tank details and fuel filler points to be among the most awkward parts to get right.